I specialise in advanced Electric guitar and Acoustic guitar playing. Here are a few of my youtube videos, now over 450,000 views. 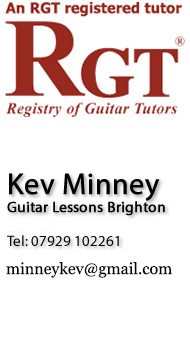 "Kevin specialise in more Advanced guitar playing, If you want guitar lessons and your based in brighton, Kev's your man"